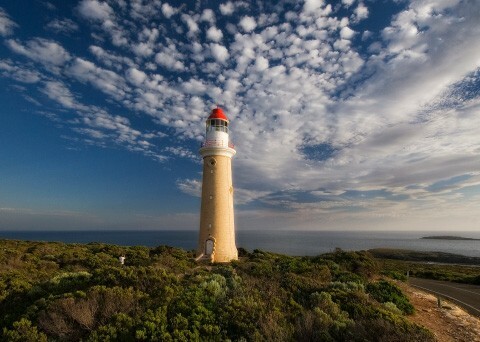 Kangaroo Island is fast becoming one of the world's most desirable tourism destinations. This spectacular island lies off the mainland of South Australia, southwest of Adelaide. Over a third of the island is protected in nature reserves and is a haven for native wildlife such as sea lions, koalas and diverse bird species. In the western part of the island, Flinders Chase National Park is known for colonies of penguins and striking coastal rock formations, for example the sculpted Remarkable Rocks and the stalactite-covered Admirals Arch. 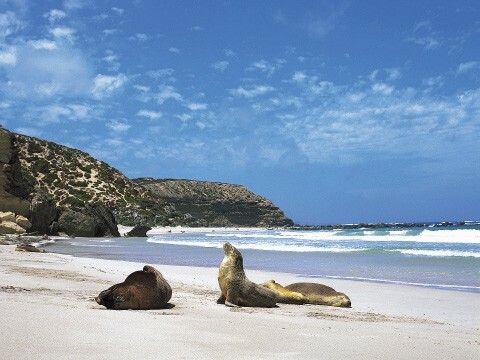 Thanks to its striking geological features and diverse and approachable native animal species, Kangaroo Island has developed a reputation as Australia’s answer to the Galapagos Islands and, as such, is being sought out by travellers from across the world. 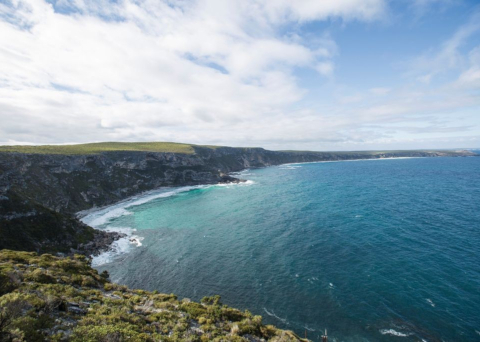 Weaving its way across the island and along its coastline overlooking the majestic Southern Ocean is the 61 km Kangaroo Island Wilderness Trail. 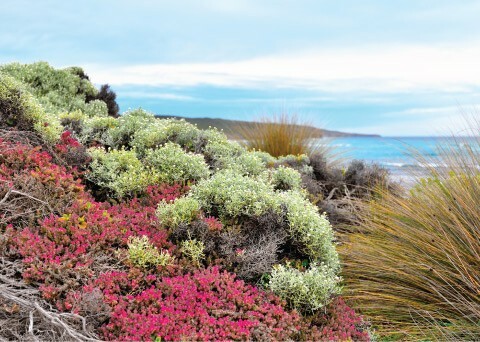 A five-day trek, this Trail takes in Kangaroo Island’s unique flora and fauna as well as hypnotic coastal beauty that has to be seen to be believed. The trek is best undertaken during the cooler months between March and November and can be taken on a self-guided basis or as part of a guided tour. Campsites are located along the Trail, alternatively more sophisticated accommodation is easily accessed a short distance away. 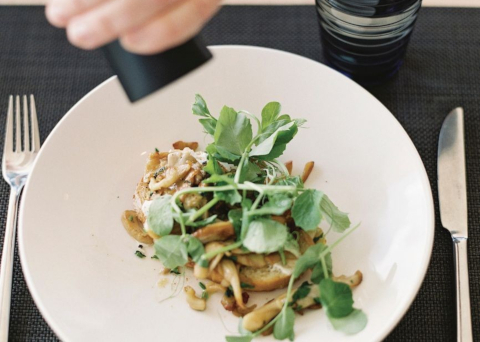 To maintain the quality and tranquillity of the experience, numbers are strictly limited - it is therefore essential to book comfortably in advance. A good level of fitness is required, and bushwalking experience recommended, to walk the Trail. Walkers can expect to walk each day between three and seven hours, depending on fitness level, weather conditions and time taken for breaks and wildlife viewing. The walk has been broken up into five sections, to be completed over five days. 12 km over roughly four hours is covered during the first day of walking. The Trail begins at the Flinders Chase Visitor Centre and heads towards the famous Platypus Waterholes. Here, lucky walkers may encounter the rare and elusive platypus. Next the path merges with the Rocky River Trail and soon becomes enveloped in dense eucalypt woodland, home to a variety of native birds and animals. Further on, the Pardalote Lookout is positioned overlooking the Rocky River far below as it flows out towards the Southern Ocean. 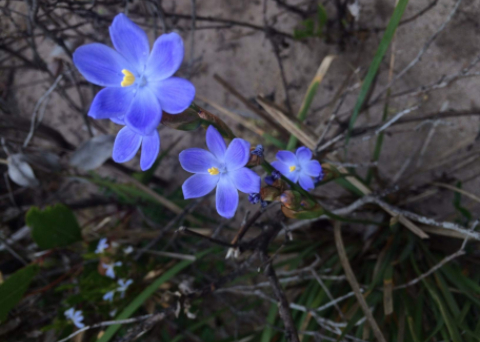 The Trail lights up as it passes through riverbank and mallee habitats where wildflowers provide a mesmerising display of colour all year around, along with orchids and fungi in the cooler months. The track passes down a ridge towards the river and arrives at the spectacular Rocky River Cascades before a welcome rest awaits at the first night’s campground, Cup Gum, a calm setting for a well-earned rest among the gum trees. More ground is covered on Day 2 with 14 km of Trail taking most walkers around seven hours. The Trail tracks along the Rocky River towards its mouth at the coast. Here walkers are treated to the first glimpse of the Southern Ocean, an awe-inspiring sight made more significant by the knowledge that nothing but deep blue ocean lies between here and Antarctica. The Trail heads south along the island's dramatic coastline where birds of prey may be seen circling over the cliffs while dolphins frolic in the waves below or, between June and early October, Southern Right Whales on their annual migration to the Great Australian Bight. As the Trail reaches Maupertuis Bay it slopes down from the clifftop onto the sandy white beach below where the remnants of shipwrecks still remain. The Trail makes its way back up to the rugged clifftop, approaching the famous Cape du Couedic Lighthouse perched on the headland in the distance, before heading inland once again. The Hakea Campground is tucked away offering natural protection from coastal winds. Relax into a restful sleep with to the rhythm of crashing waves in the distance. Nearby Admirals Arch offers the perfect location from which to view the always spectacular sunset. 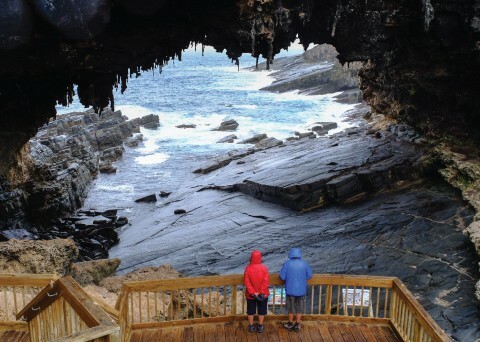 An optional side trip off the wilderness Trail is available on Day 3 to witness the popular sites of Weirs Cove, Cape du Couedic lighthouse and Admirals Arch. Walkers taking this option will be rewarded with the delightful sight of Australian and long-nosed fur seals and Australian sea-lions that visit this section of the coast. Back on the Trail, there is 13 km to cover today which should take between six and seven hours. The track first heads east towards Sanderson Bay and enters dense mallee scrub before approaching the incredible vision of the Remarkable Rocks, where another side-trip can be taken to explore more geological formations. As the Trail continues along the coastline the pace will slow to admire the truly breathtaking views in every direction. The Banksia Campground is located in a sheltered position close to Sanderson Bay where a sandy beach and restorative ocean waters await weary walkers. Rich rewards lie in store for walkers on Day 4. Over 13.5 km of glorious coastal drama, the Trail overlooks the Southern Ocean at its most raw and impressive with huge swells, imposing cliffs and panoramic views along the coast all the way from Sanderson Bay to Cape Younghusband. The Remarkable Rocks can still be glimpsed in the distance framed by the surrounding wilderness. The Trail eventually snakes inland towards Hanson Bay and transitions from low coastal heath to tall, dense mallee and tea tree. The South West River can be crossed using a punt - a long, narrow flat-bottomed boat – a memorable and novel experience. Here lies the entrance to the Cape Bouguer Wilderness Protection Area, the most untouched part of the Trail where walkers can elect to take an optional side trip to nearby Hanson Bay. Back on the Trail the route follows the river to Kelly Hill Conservation Park and the Tea Tree Campground, located alongside to the historic Grassdale property, home of the Edwards family, early settlers of the western end of Kangaroo Island. Here you are likely to spot kangaroos as they explore the open grassland to feed. Walkers can adopt a more leisurely pace on the final day of the Trail with just 7.5 km to cover, allowing time to take in the incredible and varied scenery as well as a staggering array of local and visiting bird life in the Wilderness and Grassdale Lagoons. The Wilderness Lagoon provides vital habitat and water resource even in dry years when other bodies dry out. A short walk through beautiful sugar gum woodland, decorated by orchids and fungi during the wetter months, leads to the end of the Trail and the famous Kelly Hill Caves where guided tours are available. Guided & Self guided Kanggaroo Island Wilderness Trail Walk tours are available from here. 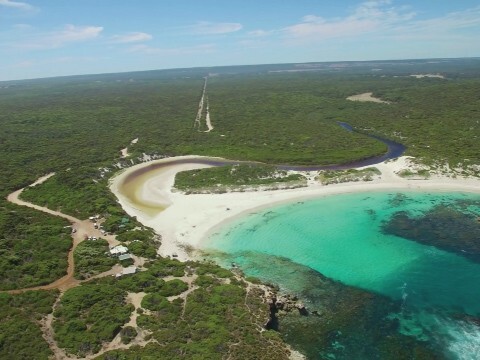 Very close to the Trail, at Hanson Bay Wildlife Sanctuary, six self-contained beach side cabins, each sleeping two guests, located 100 metres from a safe swimming beach provide comfortable accommodation for walkers or visitors exploring Kangaroo Island. 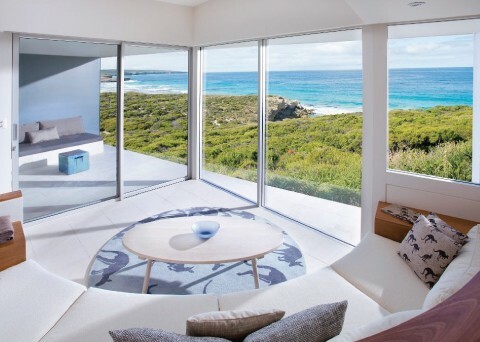 Each cabin features large windows taking in spectacular ocean views of the Southern Ocean. 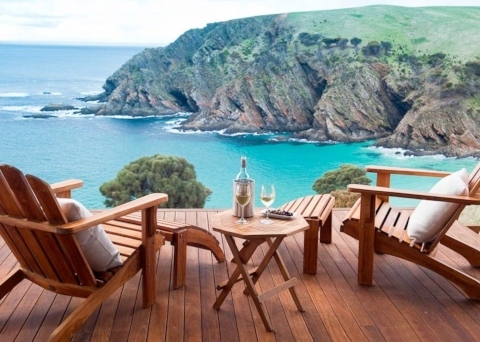 For a truly indulgent yet authentic Kangaroo Island experience, Southern Ocean Lodge is the island's premium offering. Setting the benchmark in Australia for a genuinely immersive travel experience without compromising on quality of accommodation, this luxury lodge located at Hanson Bay on the Island’s south west coast, has become world-renowned for its sensitive yet striking design, bespoke guest experience and intuitive service. 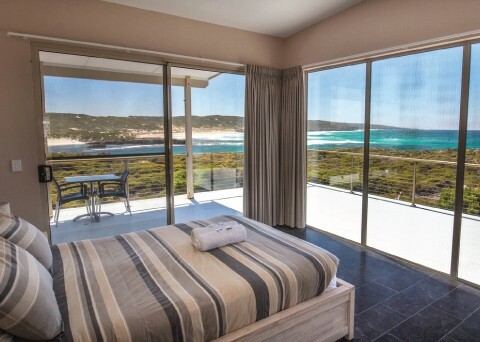 Twenty-one immaculate suites perch cliff top overlooking the wild Southern Ocean while the central lodge provides a gathering space to unwind, dine in the world-class restaurant or simply admire the unforgettable view. The highly popular Kangaroo Beach Lodge is positioned on the north-west coastline of the island surrounded by private farmland and commanding views over the stunning coastline. This fully self-contained beach house provides all the comforts of home. The Lodge includes 4 bedrooms and 3 bathrooms with space for up to 8 guests, a fully fitted kitchen, lounge area and deck taking advantage of the spectacular scenery outside. 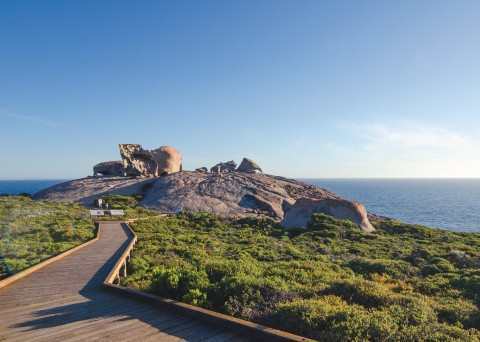 Whether choosing to undertake the Kangaroo Island Wilderness Trail, or simply explore Kangaroo Island from fixed accommodation, there is much to see and discover in this unique destination. Visitors to the island often make their first stop at Seal Bay to walk along the white sand and admire the friendly seal colony while the best place to spot koalas is on the Koala Walk at the Hanson Bay Wildlife Sanctuary. Short-beaked echidnas and large goannas can be spotted all over the island, black swans flock to American River and huge numbers of Australian pelicans gather at the wharf in Kingscote. Kangaroo Island is also a famed gourmet destination known in particular for its freshly caught seafood, cheeses and wines while also developing a reputation for its hand-crated gins, vodkas and liqueurs - a day well spend could include visiting various cellar doors, distilleries and farm gates before settling in to enjoy some freshly caught seafood at one of the many quality eateries. With so much to see and do it is easy to see why travellers are so eager to return time and time again to Australia's third largest island. For an epic escape that balances a retreat into nature with the finer things in life, it is a destination that is hard to beat. View all Kangaroo Island Wilderness Trail Walk here.